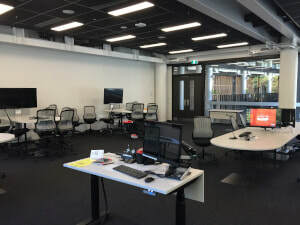 Active Learning Spaces help you engage students in their learning by enabling them to create content in groups and easily share it with the whole class. The rooms have multiple learning pods each with a built in computer. Content is shared by both the instructors and students using Zoom. The pods have built in microphones which means even softly spoken students can be heard when they are presenting their ideas. ​If you are scheduled to teach in an Active Learning Space try to book a time prior to your teaching to become familiar with the rooms. There are quick start guides in the rooms which give instructions on using the technology in the room. If you have not used Zoom you can download it to your own device and practice using it prior to your teaching. Training sessions are offered periodically and can be provided on demand. Contact your Learning Technologist or CAD academic for training on the technology or pedagogies that can be used in the spaces. Click the Zoom icon on the desktop to start Zoom. The teaching PC should be set to automatically log into Zoom when the application starts. If it isn’t logged in when you arrive in the room enter the email address and password for the room (these are recorded on the teaching PC in each lab) and click sign in. To begin a meeting click New Meeting. Make sure the ‘Start with video’ option is not selected as this means that you can share a screen but the webcam will not be started. If you see a Back to Meeting icon you are already logged on and in the meeting. To present a PowerPoint or share any other content to the rest of the screens in the room you need to Share your screen. The easiest way to do this is to share the Desktop, that means anything you have on your screen is automatically shared. Once you have Selected the Desktop click the Share Screen button at the bottom right of the window. Start your PowerPoint as normal and it will appear on all the other screens in the room. Students join the meeting by clicking the Connect to Classroom link on the PC attached to each pod. Zoom allows students to share their work with the whole class. Zoom has a built in whiteboard function. Anyone in the class can contribute to the whiteboard so it is great for brainstorming sessions. To find out more about the whiteboard click here. Each Active Learning Space has a Zoom name. This means that you can easily join the meeting from your own device and become the host. You can now move freely around the room to talk with groups of students or use software that is not installed on the teaching station PC. To become the host join the meeting before you start the meeting on the teaching computer and follow these instructions. The host key is recorded on the teaching PC. General information about how to use Zoom can be found on the Zoom Support Page. ​Talk to one of our learning and teaching team if you would like technology training in an Active Learning Space or if you would like to explore the pedagogies that can be used in these rooms.